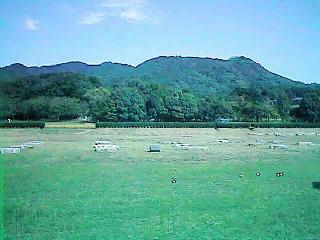 To the north of Dazaifu City, there is a mountain called Mt. Shioji Ono Fortress. This was built on its summit in 665 A.D. for the purpose of protecting the Dazaifu. It consisted of a number of buildings surrounded by a mud and stone embankment, which was 8 kilometers in circumference. All that remains today is part of the embankment and foundation stones of about 70 storehouses. Mt. Shioji was originally called Mt. Ono, a name which often appears in Manyo poetry. The name Shioji comes from the Shitenno (Four Deva kings) which were enshrined on the mountain. Walk for one hour from downtown.